Floating the River is an increasingly popular recreation in the city, it is a great way to enjoy our green city and a perfect way for the kids in summer to use up some energy and cool down when the sun gets too hot. Paddling on rivers has always been a true American experience since the days of exploration, but it isn't many places where you can experience this in what is basically a city location, with all the amenities, comfort and convenience that means. The Barber to Ann Morrison Park float is so simple that even a child could do it, and indeed as many as 100,000 people including many teenagers do float the river each year. The Boise River itself is a tributary of the Snake River, approximately 75 mi (120 km) long, and drains part of the Sawtooth Range northeast of Boise as well as much mixed land. During the summer it becomes a gentle ride through downtown Boise going through the greenbelt recreation area and passing many of the city's great parks for which it is well known. Visit Barber Park to start your visit, if you are new to floating then everything you need save your clothes and some cash are available at the park. 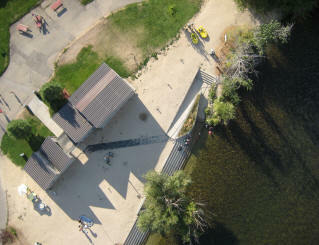 Check out the Tube Rental facilities and the Shuttles to learn how to enjoy a float on the River Boise.